Forever Green in Nottinghamshire is surrounded by nature - nestled in the trees in the centre of a stunning 70 acre woodland park. The Green Cornwall is set in a beautiful private estate surrounded by orchards, meadows and a lake, it is the ultimate luxurious escape. 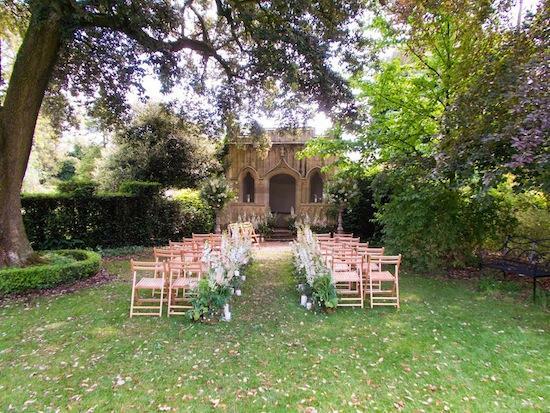 It has the most lovely arbour where you can hold a ceremony (pictured below) and what's more you and your guests can have exclusive hire of this magical venue for up three days. All of these venues offer a plan B option if the heavens open but if its just a little drizzle, make sure you have some beautiful umbrellas available, or blankets if its a bit nippy. To find out more about these venues take a look at their listings on the site….